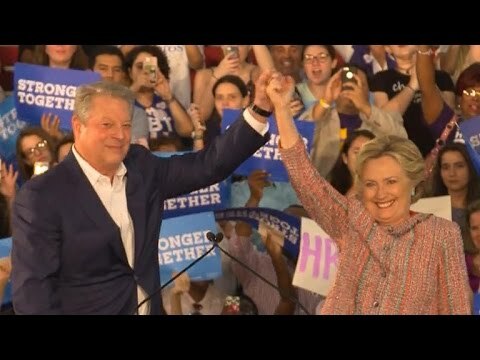 On Tuesday, Hillary Clinton campaigned in Miami with Al Gore, attempting both to shore up her credentials with both environmentalists and Millennial youth. Gore, Bill Clinton’s vice president, very narrowly lost the 2000 election to George W. Bush, mainly because of a disputed Florida count. Gore won the Nobel Prize in 2007 for his later campaign to raise awareness of the dangers of man-made climate change via his film, “An Inconvenient Truth.” The Democratic crowd chanted “you won, you won” when Gore took the podium. Gore, alluded to the disastrous presidency of George W. Bush, who launched a war of aggression and long military occupation of Iraq and allowed the economic practices that caused the 2008-9 crash. He reminded the audience of the extreme importance of voting and implied that voting for a third party was a bad idea when the stakes for the country are so high. The event became an opportunity for Clinton to stress her own bona fides on the climate change issue, which are patchy and extremely recent. She spoke of the dire threat to Florida (among the more vulnerable of the 50 states) of the various effects of climate change, from rising seas to extreme weather events to the spread of disease. Southern Florida is at particular danger for sea level rise because it rests on limestone, through which the ocean can bubble up. There’s no way to keep it out with e.g. dikes. Likewise a lot of the aquifer water in Florida is in the south and is in danger of salinization. We’ve already put so much carbon dioxide into the atmosphere that Florida is in grave danger over the coming decades and centuries. Warm water also makes hurricanes more violent and causes them to last longer. Sec. Clinton pledged to adopt policies that would lead to the installation of 500 million more solar panels in the US by 2021. That sounds like a big thing, but it is only a first step. I couldn’t find out with a quick search how many solar panels are in the US now. There are 1 million solar “installations,” but I don’t know how many panels are in each. They generate 27.2 gigawatts of solar power capacity, enough for on the order of 6 million homes. There are 124 million or so households in the US. At 27 GW, solar in the US is puny. Some 285 gigawatts of our power production is coal, 440 gigawatts is natural gas, and 74 gigawatts is wind. Germany and China both have over 40 GW of solar power, much more than the US. Germany gets over 7% of its electricity from solar, while the US only gets 1% of its from that source. In any case, 500 million more solar panels, while welcome, are by no means enough. Our house has 16 panels and in sunny months they cover most or all of our electrical needs. So 500 million panels could do that for 31 million family homes. I figure, though, that there must be 74 million or so privately owned homes in the US, so it would only be half of those, leaving out all the apartment dwellers and businesses (businesses consume a lot of electricity). She did say she wanted all homes to be powered by renewables by 2030. But electricity generation for homes is only part of the carbon problem and we need to move the business and manufacturing sectors over, too. And, what about switching to electric vehicles? We also of course need much better and cheaper storage. Sec. Clinton appeared to pledge that Gore would be one of her advisers on climate policy. Admittedly, Politico’s review of what the leaked Clinton campaign emails tell us about her energy circle turned out not to be very alarming. One of her advisers wants a carbon tax rather than a solar tax rebate, on the grounds that the former would equally benefit nuclear. Personally, I think that solar and wind are dropping in price so fast that nuclear plants are likely to be left in the dust, and besides the US public doesn’t like them and not many are being planned. But, nuclear is low carbon. In any case, a lot of climate scientists think that a carbon tax is the only thing that will save the planet, so that suggestion isn’t dire or anything. Unfortunately, Clinton has already rejected the idea of a carbon tax, and some think it is because her hedge fund backers have big investments in gas and oil. Up until 2016, it wasn’t clear that reduction of carbon emissions was a significant issue for Clinton, and she was big on new pipelines. She wanted to increase natural-gas exports, which involves increasing carbon emissions. So her sudden adoption of Al Gore as her energy (or maybe only her environmental) guru comes against a backdrop of insouciance or even obstruction on this issue. Frankly, I don’t trust her on carbon issues. I think she’s deeply in debt to the hydrocarbon industries, and that she will go much slower than is required, even if it is true that she will take some action. We’ll have to do a lot of protesting whoever is elected. But likely one of the candidates will give us longer jail terms for the protests.